After Fall Break, we were a bit slow getting back into the swing of things. That last day of break, we traveled to Colby-Sawyer for a Tuesday night match against a top-15 ranked Regional opponent. I won't go into detail about the pre-game snacking specifically, but let's say I don't think we had the proper nutrition in our systems to be at our best. We were sluggish at best to start out, and although we stayed pretty close with them, they were ahead most of that first set, and even pulled ahead by as many as 6 late in the set. We did fight back to tie it up at 23, but couldn't quite pull the victory, losing the first set 24-26. The second set was more of the same, with us trading points for most of the set, and neither team could grab a lead of more than two points, and unfortunately for us, they scored the last two, for a 23-25 second set loss. We finally rebounded a bit in the third, but despite an early lead, we never totally turned the momentum around, as they fought back in it, and we escaped that set with a 25-20 win. In this set, we only managed to hit an even 0.00 percentage, but fortunately, they were worse, and thus the win. It still wasn't quite clicking. It was very odd. Everything we did looked hard. Actually, only one person had what they would consider a good match, and that was Alice. She hit .333 for the match, which saw us hit a miserable .074. The only statistical category we were better in was service aces, so needless to say, it was a long evening of volleyball. Friday night at Trinity, we battled back and forth to start the set, and even trailed by one at 16-17, but a late 9-1 run bolstered by tough serving finished out the set for a 25-18 win. The second and third sets would be more of the same as we ended the night with 6 service aces, and a team hitting % of over .300. Saturday, after Lizzy's dad took me grocery shopping for the team breakfast, and we stopped for our earned DD run, we headed to Wesleyan, looking for our 5th Conference Win. The first set, Wesleyan was definitely in charge, and they seemed on a mission to get a win from us, making their trip to the playoffs more of a reality. They cruised past us for a 16-25 first set easy win. We weren't awful, but they were good, and we did nothing to stop them from being good. Fortunately, we regrouped well, and turned up the intensity ourselves, and started to control more of the action, staying right with them to a 17-17 tie in the second set before we pulled ahead with a 5-0 run to finish out the set for a 25-20 win. The third set was fairly close again, but we jumped out to an early lead, and then maintained about a 4-5 point lead the rest of the way to take a 2-1 advantage in sets. We finished out the match in style leading from the first point on for the clean sweep for the weekend! We had three players with double digit kills (Olivia with 12, and Becca and Alice with 11), while Hannah continued her NESCAC leading assists per set with over 10 per set. We had three people with multiple service aces (Hannah with 4, Lizzy and Olivia with 3). Piper hit .500 with 4 kills on only 8 swings, and Lizzy was our lone double-digit leader in digs with 18. Our bench did a great job of keeping the team motivated, happy and together as always, and we all know that these wins are great TEAM wins!! We had great alum fan support also, which was really FUN! 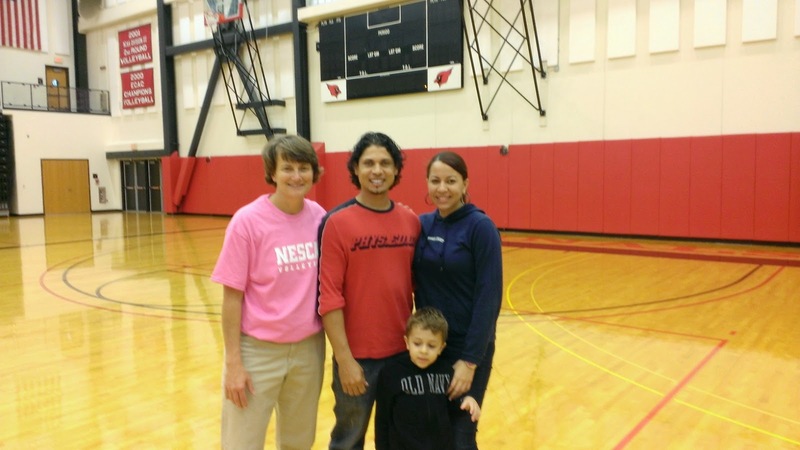 We had a former player, and several parents of former players: Marty and Joann Kenney--Katie Kenny Enslin '03, and Luz Brito Pena '04 came with her husband and son Kevin. Meg's ('14) parents, Ann and Paul came to see us and she wasn't even with us, AND brought us the awesome apples and dip (!! 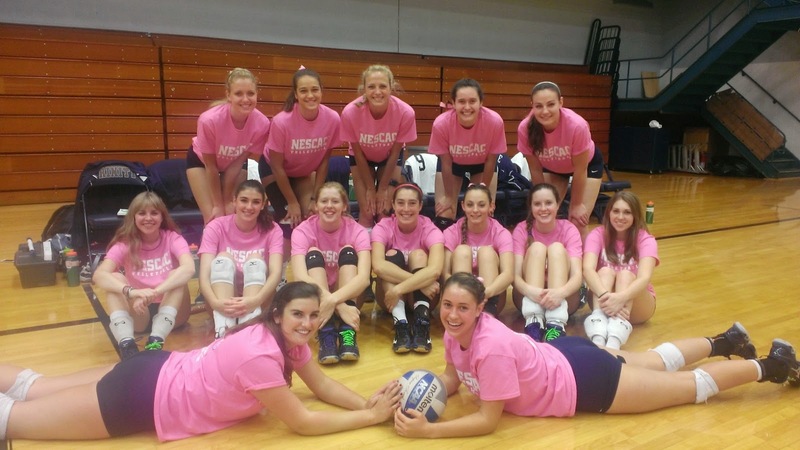 ), and also Angela Jarchow (Megan '14).